Your little bakers will love this simple craft! 1. Gather your material. 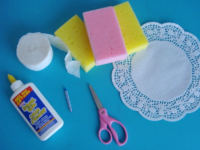 You will need three sponges (a pink one and two yellow ones), a crepe paper party streamer roll, scissors, a candle, white glue and/or hot glue, and a doily. 2. 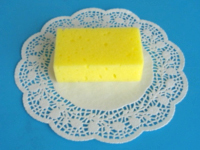 Glue a yellow sponge on the doily. 3. 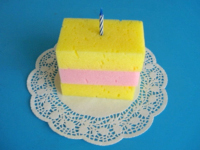 Glue the pick sponge on the first yellow sponge and then glue the second yellow sponge on top of the pink sponge. 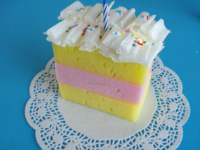 The pink sponge represents jelly whereas the yellow sponges represent cake. Make a small hole in the centre of your cake and insert the candle. 4. 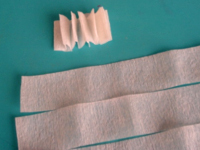 Cut a few strips of crepe paper. Fold each one accordion-style as shown. 5. 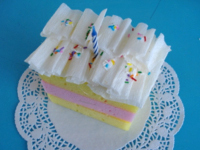 Glue the crepe paper strips on the top of your cake to represent vanilla icing. 6. 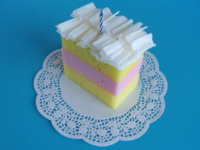 To complete your project, you may glue tiny candy pieces on the top of your cake (optional). Children will love this sweet addition!